This item is usually delivered within 14 working days. The Berkeley Raised Wooden Dog Bed is beautifully hand-made in the UK. 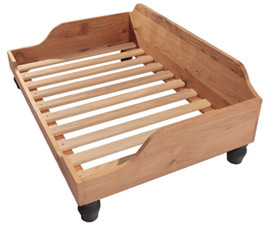 The bed frame is made from seasoned English Oak. The waterproof mattress features an individual pocket spring construction sandwiched between thick layers of wool felt and cotton offering the ultimate in orthopaedic comfort and support for your dog. The heart of any premium dog bed is the mattress. Any cushioning material has to be supremely comfortable - soft yet firm enough to provide adequate orthopaedic support. A good mattress should be able to retain its shape and a degree of bounce. 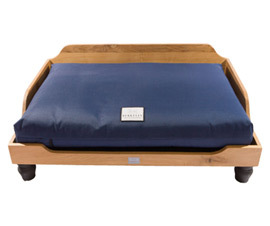 The individual pocket springs in a Berkeley Mattress provide a unique way of addressing this issue, even for larger dog breeds. The orthopaedic mattress helps to ensure even weight distribution to alleviate pressure points on sore joints as well as providing warm, breathable insulation from cold, hard surfaces. Stylish in your home and, more importantly, so comfortable and supportive for your dog. Designed, engineered and manufactured exclusively in the UK by leading craftsmen. A highly attractive and practical piece of furniture to complement both town and country homes. 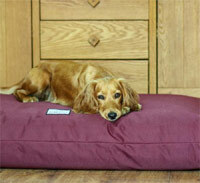 Simply choose the size of bed your dog needs and the colour you would like for the waterproof mattress cover. 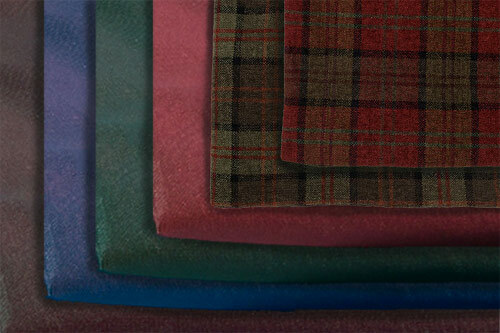 Then select whether you would like an optional fabric overcover in chenille, velvet or polar fleece. Made of solid English Oak and finished with a non-toxic oil and then waxed by hand to bring out the rich natural colour and grain of the timber and to provide an easily maintained finish. 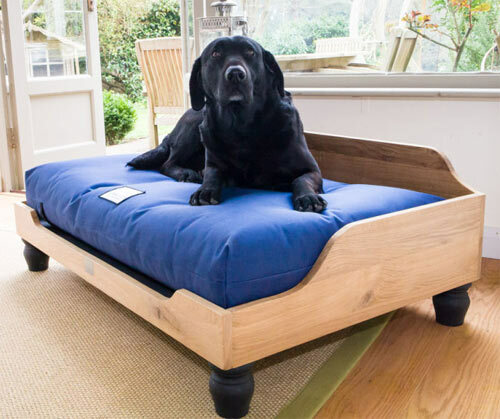 These quality wooden dog beds are raised from the floor on turned pine feet finished in a smart matt-black to give a pleasing 'floating' visual effect. They have a slatted base to allow for easy cleaning and for air to circulate so the mattress can 'breathe'. The mattresses is 15cm (6") deep and comes with a tough 100% waterproof PVC–backed polyester cover as standard. You can then choose an optional fabric overcover that can be used to provide a warmer, softer feel. They simply slip on over the top of the waterproof cover. In this way, your dog's new mattress has the ideal dual combination of covers - soft, breathable and warm with an inner waterproof protective cover that provides a barrier to the mattress filling becoming damp, smelly or a potential home for dust mites, fleas, mould and body oils. 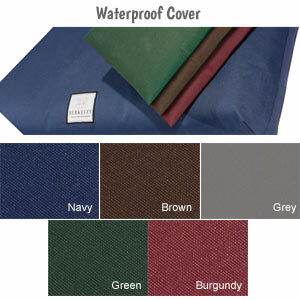 Covers are a fully fitted pillow case design with heavy duty Velcro closures. Zips have been avoided as they are prone to damage from chewing. The waterproof mattress cover can be spot cleaned with a damp cloth, hosed down or machine washed to keep it clean and fresh (30 degrees centigrade on a light wash cycle with no fabric softener). Do not tumble dry.